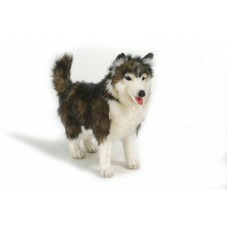 Hansa Alaskan Husky Dog Stuffed Plush Toy Animal -- The husky is a breed of working dog from Siberia. It is a medium sized dog that is used as a sled dog, watchdog and pet. Many have been imported into Alaska, specifically to be used as a sled dog. Huskies have a double coat of hair. The undercoat consists of soft thick fur and the outer coast is soft smooth hair giving it a well groomed appearance.